Researching Niemeyer on the internet, there are some positives I have read about him, and some negatives, mainly his authorizing of killing the 10 member pack of WhiteHawk pack, but I will buy the book and check out his memoir myself. I read the reasons why he authorized the killing of the pack, but reading as to his means and significations of the killings, mainly showing how easy it is to kill Wolves, I am optimistic of Niemeyer. Niemeyer begins his book writing of the killing of the Whitehawk Pack. At the time I was furious. So were many others, in fact, hundreds of people contacted him to express their anger. Niemeyer gave a personal phone call to everyone. That took a huge amount of time. He cared and he listened. He treated ranchers the same equal way. He won most of us over. Here was a FWS manager who cared what you thought. He also went by the book without showing favoritism. These things were exceptional, and that’s why I’m glad he wrote about his experiences and of what he learned. The views of an uncommon person like him are ones I take seriously and think many others will too. Ralph, thanks for posting this. I’ll order Carter’s book so I, too, can have it by Christmas to read over the holidays. I have ordered his book and will read it. As I mentioned, the only information I have of him is what I have read on articles on internet sources, but am curious on reading his book. I did read that he was hesitant on killing the WhiteHawk Pack, but it had to be done. The one perspective I have of him so far is that he is a hunter and has not put his hunting emotions of change due to Wolves against Wolves. I do see in him in some ways, as TripleJ stated, genuine. Having met Mr. Niemeyer after reading about him in two different books about the NRM reintroduction I found him to be quite approachable, down-to-earth and not favoring anyone. As the years have passed, and especially during the many months after the Whitehawk pack’s demise, I found that Carter’s demeanor about his work was one of defending his actions and not allowing others to define him for this one incident. I also recall later in the day following his presentation, in the corridor outside the hall, a number of folks were trying to “corner” him about the Whitehawk pack and his role, they didn’t seem to accept his explanation of why… I was getting kind of upset at them and interrupted them and clearly asked Carter if he had to take an “oath of office” – as most federal employees must – when he took the job. He said he did, I asked him if it defined his role in such cases, he responded that it did. I then looked the confronters in the eye and asked them, and what part of this set of job requirements don’t you understand? Or don’t you even realize that this is what he has to work within and that he even had to take such an oath? Many of them had no clue about such conditions, so I found with another group later in the year who were challenging Dr. Doug Smith in the same way. I asked the same set of questions when I had the chance and most of that group were surprised to find that he, too, had to take such an oath. Most folks who take an oath remember it throughout their tenure on that job. The majority of the folks whom I am suspicious about remembering taking such an oath – and what it means to honor it – would be many politicians and some agency folks who are there “at the pleasure of” some politician. Having read a galley copy of this book, I can say that it is well worth the read. It is not only a “good story” it is a major chunk of the untold story of the wolf reintroduction and the management of them afterward, up to the point of the Whitehawk pack incident. A chunk that everyone who even thinks they know anything about the reintroduction should read this to get the “insider’s” take on this historic timespan, it’s the only one in print so far. As for Carter’s honesty, I can only say that when I ask him about the tough stuff, he doesn’t pretty it up just to make me feel okay or more accepting of him for whatever reason. He tells it like it is and I admire and respect him for it, even if I don’t like the answers. He said to me once, “I don’t play favorites when it comes to species, whether it’s cows or wolves…” while we were discussing the Whitehawk pack. From that point on, I knew I was dealing with a “straight shooter” and have never doubted his honesty because of it. Hope that it becomes a best seller for the information it imparts to the world. I don’t think this was written for the money, I feel that he wrote this in order to tell the story in an honest manner meant to bring out the truth of the events and dispel all the fevered crap that is being flung about and accepted as truth when in reality, it is not. Kind of the anti-FauxNews version of the truth. I finished the book this morning and I was somehwat prepared for what he had to say about Animal Damage Control, now Wildlife Services, because of my many conversations with over the years. I guess I was a little surprised at how hard he was on them. I see this as a confirmation of what we’ve been saying about the agency for many years. There are a few notable exceptions within WS like Rick Williamson who actually does his job and questions whether wolves were actually responsible for depredations but there is an incidious culture of hatred for wolves by the agency and an utter lack of accountibilty due to this culture. When the trappers are reprimanded for filing in depth reports showing that wolves were not responsible for a livestock death and then pushed to confirm that wolves were responsible then there is a real problem that needs to be ended. If I am to believe what Carter has written about Wildlife Services, which I do, then the only conclusion that I can make is that WS is extraordinarily unprofessional and quickly needs to get its house in order. The irony of their accusations toward another entity about their professionalism is not lost on me. Who in the he’ll do they think they are? I did not like that Carter was responsible for killing the whitehawk pack, but I understand he had a real hard job to do. Whatever he did and whatever decisions he made, he probably pissed one side or the other off. He had to deal with wolf hating ranchers/hunters and wolf advocates and it must have been difficult to strike a balance between the two opposing groups. I’m sure there were times when ranchers wanted certain wolves killed and Carter didn’t end up killing them and I am sure there were times when he felt that killing specific wolves was the only logical thing to do to please ranchers. He was in a real tough position trying to please all parties involved in the wolf issue. He did the best he could do. I’ve emailed him a few times and he seems like a very nice man. I consider him to be one of the top wolf experts in the world. Wolfer is crisply written and layered with reflection, biting irony, gruesome detail, rich insider information, intrigue, and much humor. But, alas, its author is no Aldo Leopold. Leopold’s nuanced writings were transformative, cogently reflecting the arc of the author’s evolution. In them, Leopold expressed remorse about his former ignorance of the dangers of the [Judeo-Christian-fueled] dichotomy separating man from nature and his killing of sentient beings. He also wrote about his transition toward a fundamental understanding that every life is sacred and integral to solving the ecological crisis — including Niemeyer’s “varmints”. Notwithstanding his begrudging attachment to the charismatic species, Niemeyer never apologizes for ordering the 2002 execution of the iconic [Whitehawk] wolf pack for killing two calves and a sheep on the Baker ranch (despite the sentiment of a member of the Baker family: “[w]hy did we bring wolves back if all we’re going to do is kill them?”). Wolfer, at its best, sheds a harsh light on the atrocities committed annually by USDA’s Animal Damage Control agency (a/k/a Wildlife Services) against millions of “target” animals (e.g., coyotes, wolves, bear, mountain lions, eagles) and “non-target” animals (e.g. eagles, songbirds) — the Blackwater equivalent of federal wildlife hit men — on behalf of subsidized, powerful ranchers exploiting mega-grazing allotments on the public’s imperiled forest and range lands. Niemeyer’s vivid and informative descriptions of these atrocities, the agency’s internecine political agendas, and corruption of sustainable federal and state wildlife management policies, speak volumes about why the rogue, tax-payer funded agency and its arsenals of poison and ammunition must be abolished. 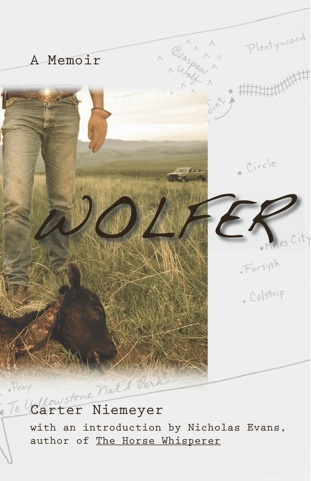 In this sense, Wolfer is an important book. That’s the best review I’ve seen of this book and I agree with everything you said. Thank you for your eloquence. You’re very welcome. After reading Wolfer three times cover to cover, line by line, and much, much introspection, I made the considered decision to write the review. Wolfer is a riveting read and an invaluable source of research information. I hope that the talented author continues to shed an unblinking light on Wildlife Service’s schemes and share his findings with wolf advocates.